Woodgas is a combustible gas made from wood. In a gasifier, air is sucked into glowing mass of coals. Through several reactions, carbon monoxide and hydrogen gases are formed. These gases, added to the nitrogen in the incoming air stream are sucked into an internal combustion engine that is connected to a generator. That's our way of getting energy from a renewable resource, our dead trees. This concept has been around since the first internal combustion engine was invented, and, even before that, the idea of making a combustible gas from wood, coal, etc. 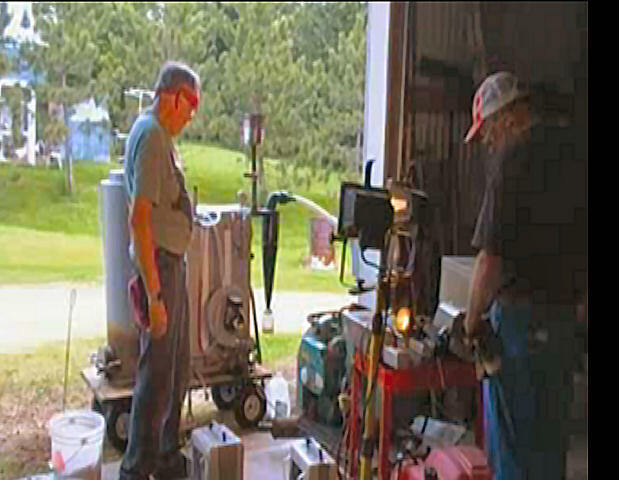 has been used to pipe gas through the streets of big cities to provide heat and light. Our ultimate goal with woodgas is to produce all the electricity we need, including electric heat with our own CHP (Combined Heat and Power) woodgas system. The idea is to take advantage of our state's net metering laws. We would use the grid as our storage battery, so to speak. Instead of heating with a biomass furnace, which needs constant attention, we want to be able to run our system for one day each week to produce the needed power. 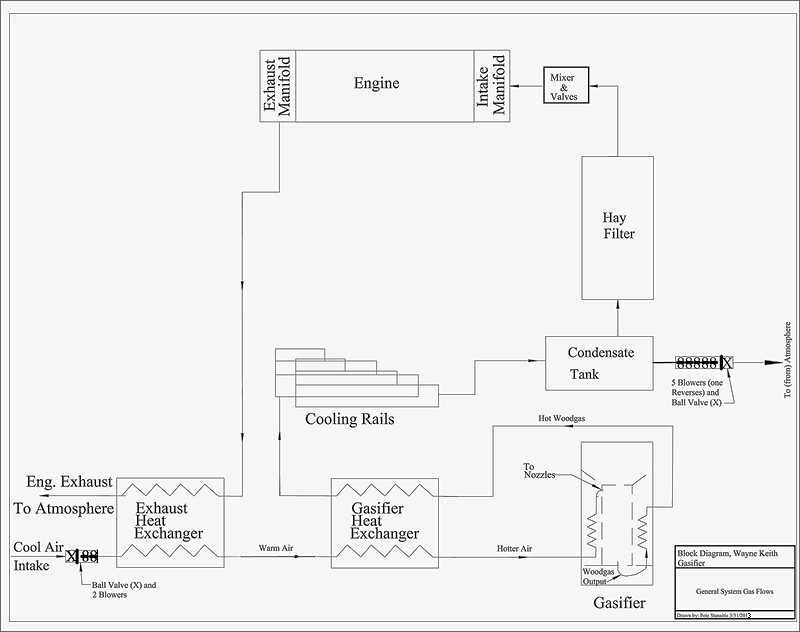 In addition to the net metering, we want to be able to do as much cogeneration as possible on that day, charging an "Energy Storage Unit" (boxa bricks, as I call it) and using waste engine heat to heat the house as needed on that day. We think wood chips will be our fuel of choice. 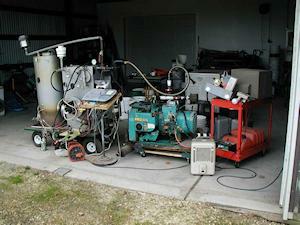 We now have about 6 years of experience with our JXQ-10A Chinese Gasifier and with generators to run on its woodgas. 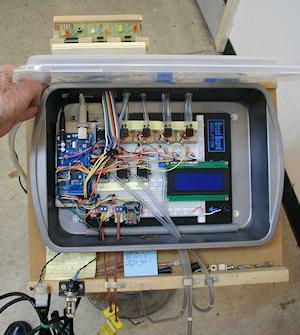 Here, you will see what experiments have been going on. 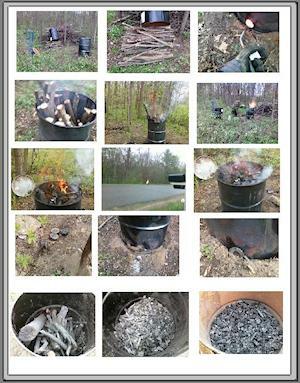 As part of a small group in western Wisconsin, I am just getting into Charcoal Gasifier. Here is the latest. 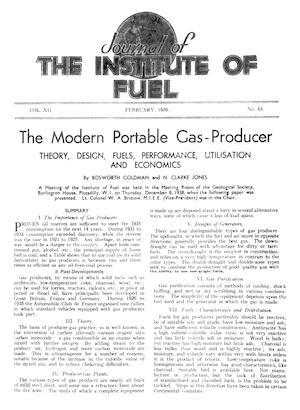 British article from 1939 summarizing the state of the art in Portable Gas Producer Technology. This is a heavy, long technical article. Go here only if you are truly interested! I recently got Wayne's book "Have Wood Will Travel" and drew this diagram to help me "see" how the gases flow through the system .